Clean, quiet property with friendly staff and above average maintenence.submitted by Duane T. - Apr 02, 2019 |Recommended: YesI've lived here for over 6 years with absolutely no problems at all. I am a service technician and have worked in hundreds of apartments in the Hampton Roads area for many years, this property is well above average compared to all my experiences over the years. I enjoy living heresubmitted by Liliana A. - Mar 05, 2019 |Recommended: YesComplex grounds do not look great on the outside, which deters BUT the staff is great and the overall apartment inside is nice. I enjoy living here. 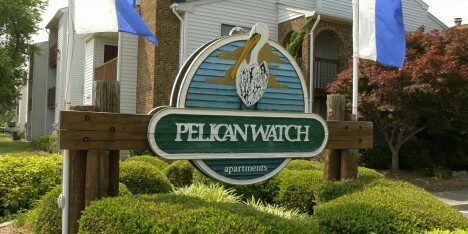 Great place to livesubmitted by Pamela G. - Dec 30, 2018 |Recommended: YesI enjoy living at Pelican Watch, The office and maintenance staff are wonderful. response from property - Feb 07, 2019 Thank you so much for the great review. We love having you here and hope that you stay for a long time. Great apartment with minor issues.submitted by Edgar A. - Dec 01, 2018 |Recommended: YesIt's nice living here. At night the place is so bright with those newly installed light bulbs. I won't let this opportunity pass without mentioning Karen who was so helpful and very accommodating. The only things i'm not satisfied about are the potholes on the road inside the premises. You can also hear loud footsteps upstairs when the people are walking. I love itsubmitted by Ejaniya G. - Nov 26, 2018 |Recommended: YesThis place has been great so far. I've lived here for about 4 months now and have had no issues I needed my toilet fixed and maintenance was right on it in about 24 hours. Parking is pretty good, I usually get a spot in right in front of my apartment, 8 10. The only issue I've noticed lately is there has been quite a bit of trash laying around compared to how it was when I first moved in. I'm not sure if this is b c of new neighbors or what, either way, maintenance and the groundskeepers do their best to keep it tidy and presentable. The office staff is AMAZING mad friendly. I love Karen If all continues to go well, I don't see myself moving anytime soon. Beautifu Place to Livesubmitted by Heather B. - Oct 25, 2018 |Recommended: YesI love living here. I love the proximity to things and the safety I feel here. Having the manager on site is a bonus. Neighbors are quiet and keep to themselves. Good for first apartment.submitted by Danielle S. - Aug 02, 2018 |Recommended: YesGood for the most part. Only thing I really don't like is that I can hear every foot step from the unit above me. Very nice staff and neighbors.submitted by Leah J. - Dec 05, 2017 |Recommended: YesVery quiet, even though there are kids in the community, you never have loud music noise outside or really any disruptions. Great Staff, They always ready to help.submitted by Pegguy - Oct 29, 2017 |Recommended: YesThis place is amazing when it comes to maintenance. And the staffs at the office always ready to taking care of you. It's a great location for military members station in Virginia Beach. Affordable, convinent, dependablesubmitted by Steven B. - Jun 24, 2014 |Recommended: YesLocation, affordability, great maintenance staff and customer service from Leasing office. Mellowsubmitted by Brian C. - Jun 07, 2014 |Recommended: YesFor the most part, I really like it.